"Humanists" (generally atheists) are making a rude gesture to Christians by having their so-called "National Day of Reason", fallaciously pretending that being an atheist makes you "reasonable", and being a Christian makes you unable to reason, on the same day as the American "National Day of Prayer". Of course, they already have their holiday, it's April 1, but I reckon they chose that day simply to be obstreperous. 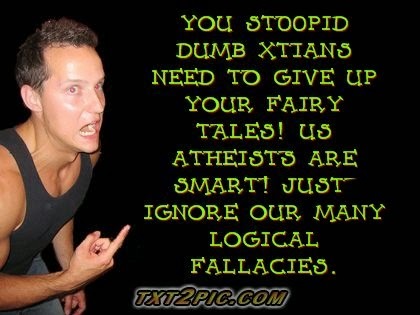 Atheists are getting more obnoxious all the time. Matt Slick of CARM was going to be involved in the National Day of Prayer on the Utah Capitol steps, but the atheists had already reserved that space. On April 27, 2015, Matt issued a debate challenge to the Idaho Humanist Association. To demonstrate that Idaho Humanists are confident, respectful, and rational, he was answered with a stampede of logical fallacies and outright libel. Christians get that a lot, especially when we can point out how those who claim to embrace "reason" are so unskilled at using it, and are driven by emotion instead of logic; they hate it when we out-reason them. You can listen to Matt's commentary at the beginning of these radio shows (free MP3 downloads), April 29 and April 30. EDIT 1: May 4 has some comments from the 15:15 mark through 24:45. Speaking of libel, I had been advised to point out and refute blatant defamation by a furious bundle of incoherent apostate hatred, stalker troll tinhorn Ashley Haworth-Roberts. In other posts and articles, I have shown how "Haywire" is incoherent and illogical. Since a Christian Weblog was allowing misotheists to be recalcitrant and turn the thing into their own litterbox, personal attacks were left standing. I had to deal with something, and took screenshots of these things in case they are deleted from the Weblog in question (it had a good article), which would be smart because they are supporting libel and defamation by letting them stand. I added color to his remarks that does not appear in the originals. I've thought long and hard about replying. This is ridiculous. The Admin(s) tell people to act in a civil manner or their comments will be removed. What happens? Atheopaths turn it into a litter box, with no consequences. If you're going to be a party to allowing assertions, you could at least require evidence. One resorts to logical fallacies, and when I point them out, he gets uppity and decides I'm not worthy of his attention, but cannot answer my challenges to his bad "reasoning". The stalker attention whore (a bitter apostate who cannot string two logical thoughts together), meanwhile, continues to bring in irrelevant personal attacks, terrible logic, off-topic remarks, outside links, and more. Since I've been called a liar by this liar, I'm going to address his latest attack. It would be fair to let this comment stand, since his multitudinous nonsense has been left untouched. Looks like he got kicked off that Forum of Futility and Hatred again (there was a complain that they're "bored rigid"), so he's bringing his garbage here. "I see that the fraud and coward Sorensen"
Defamation. Look up ad hominem. 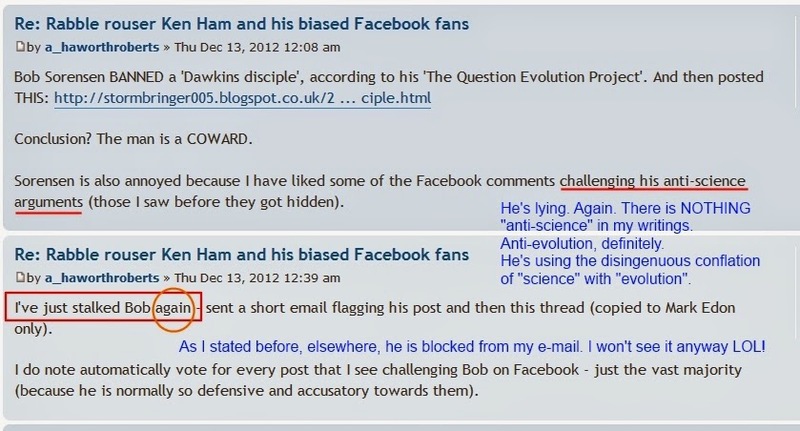 "is falsely libelling me a 'bully' ('misotheist bully') behind my back on one of his blogs that he probably hoped I would not read: http://biblicalcreationandevangelism.blogspot.co.uk/"
No, he's a stalker and reads my material almost every day. This is pretty much an appeal to motive fallacy, but he has no basis for his irrational claim that I "probably hoped" he would not read my Weblog. It is also further defamation, since there is no evidence provided that whatever remarks was made was about him. Everything is not about him, in case he did not know. "and exposes his anti-science bias"
This is another defamatory lie, and a manipulation using conflation. He frequently pulls this stunt, and I have made it clear that I am in no wise anti-science (an amazingly vapid claim conflating "evolution" with "science", a sneaky bait 'n' switch from fundamentalist evolutionists). Another ad hominem. How do I fallacy thee? Let me count the ways. But mostly personal attacks. I have repeatedly documented his failings in reasoning and morality. "whenever we directly interact - so runs away, sulks, and then libels me on his blog where NO comments are permitted." He does not even know what libel means. Whenever I show his failings, it's "Libel!" For that matter, biblical creationists are "liars", as you have seen here. Sweeping generalizations, and an apparent inability to understand the difference between expressing contrary interpretations of evidence and a demonstrated willingness to deceive. As for the last lie, "on his blog where NO comments are permitted", first, he needs to demonstrate libel (I have shown repeatedly how he libels me, and he brags about his libels spamming.) No comments allowed? One time, he accused me of switching off the comments on Piltdown Superman because of him. Ego much? The truth is, that weblog never allowed comments for various reasons. The one the liar was crying about, however, does allow comments. So does Stormbringer's Thunder, my original Weblog (see here). Thanks for letting me set the record straight on a few things. If you want more documentation, go to Piltdown Superman and do a search for "haywire". Unfortunately, since the inmates run the asylum here, I can no longer in good conscience promote this Weblog. I'm done here. Harsh? Yes. Necessary? Absolutely, both legally and to show that Christians do not have to be Wimps for Jesus (look for Challenge-riposte paradigm here). I've dealt with harassment from this stalker for a long time. I won't show you the things he says about God, but it seems he can't make up his mind whether or not he's an atheist or agnostic. So, what did I gain by proving that he is illogical and a liar? The fraud Sorensen is asking yet again for blatant censorship. The man is an evil hypocrite (or mentally challenged). I am not and you CANNOT prove that I am. His latest cowardly attack against me was not posted on his daily blog but an obscure one that few people know about. The link in question WAS about me Liar Bob. If I commented at your propaganda page that I linked to you would INSTANTLY delete the comment. You are an extremist who wants anti-creationists silenced from the web. So you can pretend that you 'won' an argument. The rest of your reply is just pseudo-intellectual waffle. Are you still saying 'Lucy' will be 'shelved'? In your dreams. The Lake of Fire beckons Liar Bob. The example at the top with Matt Slick's dealings with a "Humanist", and my libelous harassment from a stalker (which is criminal activity, by the way, so he's in trouble for that as well as defamation) are typical examples of how "tolerant" and "rational" many atheists can be. These atheo-fascists are angry and bitter, and Their Father Down Below knows that time is running out, so he's pulling their strings even more. Also, they are upset because Christians are better equipped to use logic than they are, and the scientific evidence supports special Creation, refuting evolution. They need to repent while there's still time, else they're lost forever. Secularists will not have the final victory, that belongs to God.